There's only one LCD, so you can't see who's calling. Alcatel has dared to add a flip mechanism to its phone. We say dared because for this bargain basement price, it is something of a surprise to find a flip, as the hinge mechanism for a clamshell makes this type of phone slightly more expensive to manufacture. The flip is not its only physical attraction - it has an impressive colour exterior too. We tested the £25 Virgin Mobile version of the phone, which comes with psychedelic purple-pink front and rear fascias. As a slightly more subtle alternative, the E256 is available in Orange pre-pay packs with more sober chrome-coloured panels. 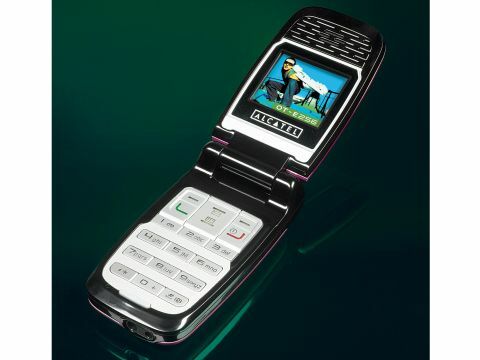 The trouble with budget clamshell phones, however, is that they can't afford to offer two LCD screens, so you can't see who is calling without opening the flip, let alone have easy-to-see clock display, battery meter and so on. Alcatel makes amends for this with three simple external indicator lights, which helpfully show you when you have received a text message, and also tell you where your phone is if you receive a call in darkness. The screen is small, and can only show three lines of an SMS at a time. It offers full colour, but only in 4000- different shades, but as there is no picture support, this low-resolution passive screen is adequate. The only time that the screen is really put under strain is when you are playing the two inbuilt games. These are fun and familiar variants of the Wallbreaker and Tetris console classic versions. This dual-band phone offers a 255- number memory, four alarms, vibrating alert, T9 predictive text and a calculator - basic fare even for a phone in this price band. Unfortunately the onboard ringtones are disappointing lowgrade polyphonic affairs that sound like they might have been composed on a Stylophone. Although you could always claim they were retro!